Around 1716: he is adopted by Haruyama Genshichi I and receives the name of Haruyama Naotarô. 11th lunar month of 1732: Haruyama Naotarô takes the name of Haruyama Genshichi II in Kyôto at Miyako Mandayû's theater, playing the role of Takasago Okinanosuke in the kaomise drama "Hatsu Butai Kogane no Ishizue". Fall 1733: Genshichi goes to Ôsaka. 11th lunar month of 1733: Genshichi plays at the Ônishi no Shibai the role of Kokonoe Chikaranosuke in the kaomise drama "Shigeri Matsu Kogane no Takaragura", which is produced by Nakamura Jûzô I. 1st lunar month of 1734: Genshichi's rank in the Ôsaka hyôbanki, tachiyaku section, is jô-jô (superior - superior). 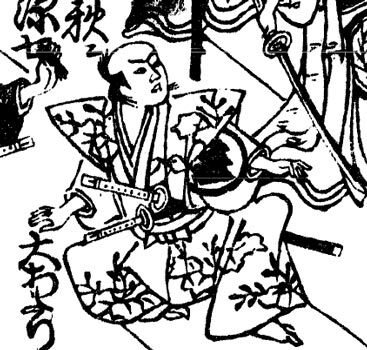 He shares the same rank with Murayama Heijûrô III, Sakurayama Shirosaburô II and Anegawa Shinzô. 11th lunar month of 1734: Genshichi plays at the Ônishi no Shibai the role of Hisamatsu Tôkichi, in reality Nakatsugawa Tokiwanojô, in the kaomise drama "Shigeri Matsu Kogane no Takaragura", which is produced by Nakamura Jûzô I. 1st lunar month of 1735: Genshichi's rank in the Ôsaka hyôbanki, tachiyaku section, is jô-jô-(shiro)hankichi (superior - superior - (white) half excellent). 11th lunar month of 1736: Genshichi plays the role of Tabakoya Gensuke, in reality Segawa Jûnai, in the kaomise drama "Yamato Fumi Mannen no Ayatsuri", which is produced by Iwai Hanshirô III at the Kado no Shibai. 1st lunar month of 1737: Genshichi's rank in the Ôsaka hyôbanki, tachiyaku section, is jô-jô-(shiro)kichi (superior - superior - (white) excellent). He shares the same rank with Sadoshima Chôgorô I. Fall 1737: Genshichi goes to Kyôto. 11th lunar month of 1737: Genshichi plays at Miyako Mandayû's theater the role of Kokaji Tokinojô in the kaomise drama "Kuni no Tomi Sakae no Hachinoki", which celebrates the arrival in Kyôto of the Edo star Ôtani Hiroji I and the return from Edo of the local actor Kameya Jûjirô I. 1st lunar month of 1738: Genshichi's rank in the Kyôto hyôbanki, tachiyaku section, is jô-jô-(hanshiro)kichi (superior - superior - almost excellent). 11th lunar month of 1738: Genshichi plays in Kyôto in Tomimura Takichi's kaomise drama "Ichi no Tomi Hôrai Yakata", which is produced by Nakamura Tomijûrô I at Kameya Kumenojô's theater. 1st lunar month of 1739: Genshichi's rank in the Kyôto hyôbanki, tachiyaku section, is one white stroke below jô-jô-(hanshiro)kichi [visual]. 11th lunar month of 1739: Genshichi plays in Kyôto the role of Imagawa Nakaaki in the kaomise drama "Muromachi Dono Chôhô Denki", which is produced by Sanogawa Ichimatsu I for the nadai Miyako Mandayû; his stage partners are Yamanaka Heijûrô I, Ôtani Hiroji I, Sawamura Otoemon I, Tamiya Shirogorô, Asao Motogorô I, Onoe Kikugorô I, Shinozuka Kazaemon, Matsumoto Tomojûrô I and Arashi Sanshirô III. 11th lunar month of 1740: Genshichi plays in Kyôto the role of Seki Genjibei in the kaomise drama "Asuka Miyako Jindai no Maki", which is produced by Nakamura Kumetarô I for the nadai Miyako Mandayû. He also plays the role of Sugimoto Tahei, in reality Nagasaki Kageyu Saemon, in the kiri kyôgen "Hayazaki Taiheiki", which welcomes in Kyôto the actor Ogino Izaburô I. His others stage partners in this final drama are Nakajima Kanzaemon II, Nakamura Kumetarô I, Yoshizawa Tamazuma, Mizuki Tatsunosuke II and Bandô Sukesaburô I. This is Genshichi last stage appearance. 1st lunar month of 1741: Genshichi's rank in the Kyôto hyôbanki, tachiyaku section, is jô-jô-(hanshiro)kichi. He shares the same rank with Ogino Izaburô I, Fujioka Daikichi, Tamiya Jûzaburô I, Somematsu Shichisaburô I and Bandô Sukesaburô I. 18th day of the 2nd lunar month of 1741: Genshichi dies in Kyôto. Haruyama Genshichi II was a Kyôto tachiyaku actor, who made all his career in Kamigata during the first half of the 18th century. He performed in inaka shibai during the 1720s and achieved fame for himself in ôshibai during the 1730s. The three fields of excellence of this beautiful actor were yatsushigoto, jitsugoto and wagoto.